Before we get into the reviews, there’s something you should know about my background. I majored in music and minored in acoustics in college before I went to electronics engineering school. I’m a multi-instrumentalist and published composer, and worked as a sound engineer for many years, both in a studio and on the road. I still have a full digital recording studio that is separate from the equipment I use to make the videos mentioned below. So, I’m probably a little pickier about sound than most. But then, I also know a lot of tricks for warming up a cheap mic too. FYI Most products on this page are affiliate links. I appreciate you using them to help support my efforts to continue to bring you reliable info that you can use and trust. As many of you know, I make screencast video tutorials and already had a nice Plantronics USB headset for that purpose. It only costs $30 and the audio is super. Plus, it has headphones. I don’t really need them for making videos, but with Hangouts, I would have to hear others speaking. With headphones I wouldn’t have any feedback issues with the sound from the speakers leaking into the mic. Two years ago I purchased a Logitech C525 webcam, thinking that I would be making in-person video tutorials. But, I found recording the screen with Camtasia to be a better solution, so never even opened the box on the camera until I got ready to do G+ Hangouts. With that camera and headset, I thought I was all set. Not. I really didn’t want to have on the headphones while on camera, so I tried the mic in the camera first. The mono mic produced a rather tin-can sound, and the volume level was quite low unless I was less than a foot away. I wanted to be at least two feet away. And, it was omni-directional, so it picked up the room echo too. which only got worse when I moved back, away from it. Years ago I purchased a product similar to Dragon Speak, which is voice recognition software. It came with a desk mic. I gave that a try. 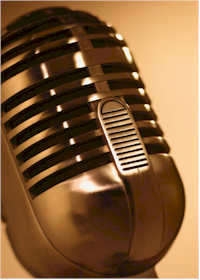 Not being made for fidelity, the audio quality on it was even worse than the mic in the camera. Next I tried a Blu Snowball Mic. It is a condensor mic, and generally they are rather warm. It was, as long as I was no more than six inches away from it. On the back it has a switch for three settings to change the pick up pattern from omni-direction, to cardiod, to super cardiod. Basiclly, omni means that it picks up sounds all around. Cardiod means that it picks up in a heart-shaped pattern, with the widest field in the front. Super cardiod is much the same, but has an even more narrow field. In essence, it picks up what’s right in front of it and rejects sounds from the back, like sound coming from the speakers. That would be ideal, except that as I switched to the second and third settings, the volume decreased significantly. Because I had such bad luck with the Snowball, I didn’t bother trying the Yeti because I knew that it had much the same build and would have the same proximity issues, meaning that I would have to have it close to get enough volume. The last thing I wanted was a big mic sticking in my face while on camera. Now, that’s not to say that the Yeti mic isn’t nice or won’t work for this purpose. It didn’t work for me with wanting to get it out of the frame of view, and sitting that far back. I read a lot of reviews on the C920 that said the image quality was better, but so was the audio. It had better stereo mics. So I gave it a try. The reviews were right, it was better on both counts. But, you still have to be closer to the camera than I wanted to be. See below for audio settings on the camera that may work just fine for you. I knew there were plenty of pro mics that would work, so I hoped down to my local Guitar Center and picked up a Sterling SP50/30 Mic Pak. It came with a desktop and shotgun model. Both are phantom powered condensors, meaning that they required an external power source. And, I wanted to be able to adjust the gain (volume) higher before the audio reached my computer, so I also got a Personus Audiobox. I supplied the phantom power and proper XLR plug for the mics. And it also had a preamp in it so I could turn up the gain. Plus, it also supplied the USB connection to the computer. As long as I ramped up the gain, the desk mic worked fine because I could set it low enough and away so that it was out of the shot. But, turning up the volume like that also made the preamp pick up the internal system noise from the desktop computer. In other words, it sounded like I was talking next to a popcorn machine. Unfortunately, the shotgun mic had the same problem. After all of this trial and error, I seriously considered building my own. Believe it or not, I still have a landline, and use it to teach classes since I’m usually on it at least six hours a day. I have a super nice, super comfortable, corded earpiece for it made by Plantronics. After all of this trial and error, I seriously considered using one (I have extras) to build a prototype for the kind of USB mic I wanted. Instead of the gray boom (part that comes out toward your mouth), I wanted the kind that rock stars use on stage and was hardly noticeable. I actually even started Googling to locate the R&D department for Plantronics so I could send them my prototype. During that search, I finally ran across a Skype mic that looked promising. It’s a Plantronics MX500i. I ordered it immediately. It works great! It is an under-the-ear type, and the ear bud is larger than the one I use on my phone ear set, but still comfortable enough to stay in for an hour or so. It has a 2.5 mm jack that plugs into a USB adaptor. The audio is a little heavy on the low (bass) end, and I’m a contralto, so I really bring out that quality, and so will most tenors and basses. But, it has to be shy on the high (treble) end because of where it sits in proximity to the explosive sound coming from your mouth. Otherwise, it would deliver a lot of hisses and pops. Placement matters. You’ll want to play with how close you put your standing mic to your mouth, or your boom mic to your cheek. For desk mics, consider a pop filter. For boom mics, you don’t want it directly in front of your mouth or it will get hit with a lot of explosive pops. I found that I can actually move it to the side of my face and still get the same quality as sitting next to the corner of my mouth, which puts it slightly across my cheek, and that makes it more noticeable. Play and test and do what works best for you. There may be two places to adjust your audio. One may be in the video capture software and one may be in your system settings. I can only speak to the C920 settings because that is what I’m using. In the controls, you’ll find a checkbox for Right Sound. I unchecked it because it was making noticeable shifts in the volume level that I found distracting. Go to Start > Control Panel > Sound. Click the tab for Recording. 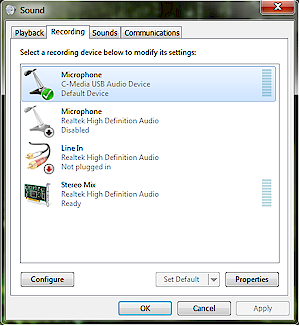 Select the C-Media USB Audio Device by clicking it once. Adjust up or down to suit. And then click the Apply button at the bottom. I searched for a guide. The most recent and comprehensive post I could find is here. If you are on a Mac and have other suggestions, please feel free to leave them in the comments below this post. Audacity is super for making digital recordings and it’s free. It’s also great for tweaking the sound after the fact too. I use SoundForge because it’s part of the Sony suite of software I use to make videos. This type of software will give you helpful visual feedback for your settings. Of course, you can do short recording with your video capture software too and just listen to it and make adjustments as necessary. Overall, I’m very pleased with the Plantronics MX500i and it is what I’ll be using for in-person videos and G+ Hangouts. I’m not vain about my appearance, but I believe the other Plantronics headset, with its dual headphones, and wide, dark boom, give an unnecessary distraction to the viewer. In other words, it makes me look like a gear head, literally. With the MX500i, the viewer will forget the mic is there and it will be more as if we’re in a room together having a conversation. And that’s what I’m shooting for. Much of the techie stuff I teach intimidates folks. If I can remove as much of the tech feel as possible, that’s going to help them be at ease and just feel like they are talking to their geek buddy who is really interested in helping them succeed. I hope you’ve found this mic review helpful and it saves you time, money, and frustration in your search for the perfect setup for your needs. There are more complex setups that are rather expensive, and they do deliver high quality, but may be more suitable for serious podcasters than for casual use, such as Hangouts. Please do leave a comment with what you’re using, and be sure to tell us why you like it. Or, tell us what you tried that didn’t work well too. I’m pretty sure the spam filter will wipe out any links, but model numbers and such will probably make it through. Note: Some of the links on this page are affiliate links. I appreciate you supporting BlogAid through your purchases and helping me continue to deliver more free resources like this to you. Your timing is impeccable! Just did a webinar yesterday and was surprised by how awful the sound was, so I decided to start researching headsets/mics today. Thanks for doing the legwork! Great article! Hope it saves you a lot of time and money, Carole. I looked high and low. Found a bunch of things, but so many were out of my budget or overkill for what I needed. Thank you so much for these fabulous recommendations. I have been researching this for a while with no success, but your post told me everything I wanted to know. Glad you found it helpful, Stephen. I wasted hours looking all over the web for good info too. Hope these recommendations work as well for you as they did for me.